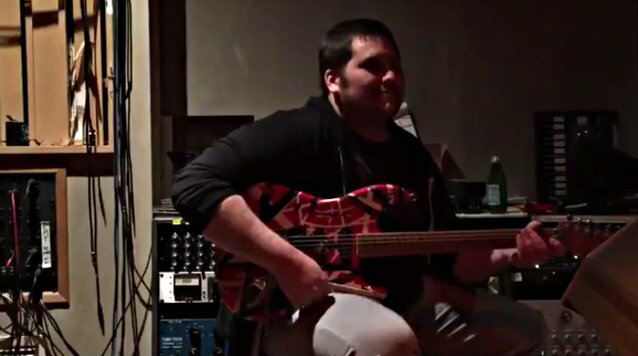 Wolfgang Van Halen marked the 40th anniversary of his father’s groundbreaking instrumental, “Eruption”, by sharing new video footage of himself playing the iconic track. The bassist can be seen performing the tune on Eddie Van Halen’s original red, white and black-striped Frankenstein (aka “Frankenstrat”) guitar, which was used to record the tune on September 8, 1977 for inclusion on Van Halen’s 1978 self-titled debut album. A regular staple of Eddie’s live guitar solos dating back to his band’s club days on the California circuit, “Eruption” introduced the rocker’s use of “two-handed tapping” as a regular part of his sound while expanding the musical vocabulary of the instrument on a mainstream basis moving forward. While the history of “tapping” on instruments dates back centuries in a variety of musical genres, Van Halen says he stumbled onto it when watching Led Zeppelin perform in Los Angeles in 1971. "I was watching Jimmy Page going [sings hammering guitar lick], like that, with one hand, in 'Heartbreaker',” Eddie told Rolling Stone in 2008. “I thought, 'I can play like that, and you wouldn't know if I was using this finger [points to left hand] or this one' [points to right hand]. But you just kind of move it around, and it's like, 'You got one big hand there, buddy. That's a hell of a spread!'" Wolfgang recently shared a brief audio clip of music from his forthcoming debut solo album, although no timetable for the project’s release has been revealed to date.